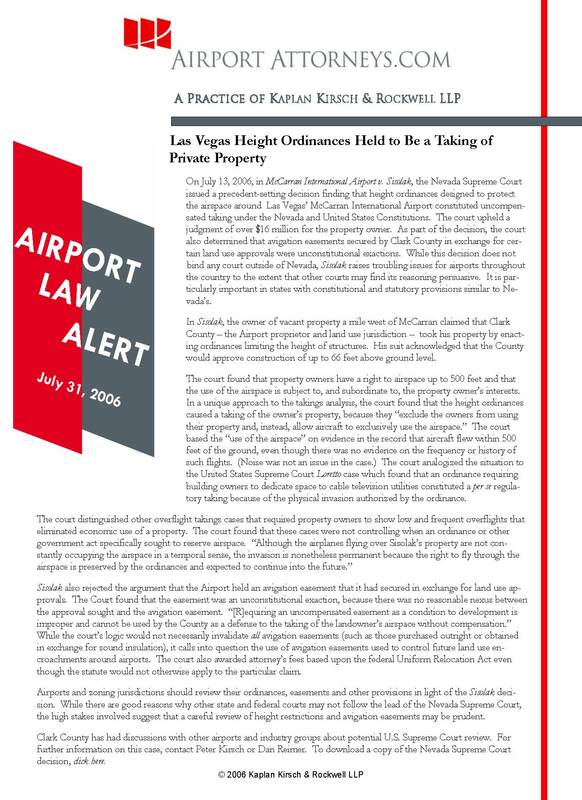 On July 13, 2006, in McCarran International Airport v. Sisolak, the Nevada Supreme Court issued a precedent-setting decision finding that height ordinances designed to protect the airspace around Las Vegas’ McCarran International Airport constituted uncompensated taking under the Nevada and United States Constitutions. The court upheld a judgment of over $16 million for the property owner. As part of the decision, the court also determined that avigation easements secured by Clark County in exchange for certain land use approvals were unconstitutional exactions. While this decision does not bind any court outside of Nevada, Sisolak raises troubling issues for airports throughout the country to the extent that other courts may find its reasoning persuasive. It is particularly important in states with constitutional and statutory provisions similar to Nevada’s. In Sisolak, the owner of vacant property a mile west of McCarran claimed that Clark County – the Airport proprietor and land use jurisdiction – took his property by enacting ordinances limiting the height of structures. His suit acknowledged that the County would approve construction of up to 66 feet above ground level. The court found that property owners have a right to airspace up to 500 feet and that the use of the airspace is subject to, and subordinate to, the property owner’s interests. In a unique approach to the takings analysis, the court found that the height ordinances caused a taking of the owner’s property, because they “exclude the owners from using their property and, instead, allow aircraft to exclusively use the airspace.” The court based the “use of the airspace” on evidence in the record that aircraft flew within 500 feet of the ground, even though there was no evidence on the frequency or history of such flights. (Noise was not an issue in the case.) The court analogized the situation to the United States Supreme Court Loretto case which found that an ordinance requiring building owners to dedicate space to cable television utilities constituted a per se regulatory taking because of the physical invasion authorized by the ordinance. Sisolak also rejected the argument that the Airport held an avigation easement that it had secured in exchange for land use approvals. The Court found that the easement was an unconstitutional exaction, because there was no reasonable nexus between the approval sought and the avigation easement. “[R]equiring an uncompensated easement as a condition to development is improper and cannot be used by the County as a defense to the taking of the landowner’s airspace without compensation.” While the court’s logic would not necessarily invalidate all avigation easements (such as those purchased outright or obtained in exchange for sound insulation), it calls into question the use of avigation easements used to control future land use encroachments around airports. The court also awarded attorney’s fees based upon the federal Uniform Relocation Act even though the statute would not otherwise apply to the particular claim. Airports and zoning jurisdictions should review their ordinances, easements and other provisions in light of the Sisolak decision. While there are good reasons why other state and federal courts may not follow the lead of the Nevada Supreme Court, the high stakes involved suggest that a careful review of height restrictions and avigation easements may be prudent. Clark County has had discussions with other airports and industry groups about potential U.S. Supreme Court review. On July 6, 2006, the United States Court of Appeals for the Seventh Circuit rejected United Airlines’ attempt to sever portions of the 1992 lease arrangement at Denver International Airport that were used to finance facilities at the new airport. Under bankruptcy law, a reorganizing debtor must either assume the lease and fully perform all of its obligations, or surrender the property. By contrast, in a secured loan arrangement, the debtor may be able to discharge a portion of the debt as part of the reorganization. To protect itself financially, United has been claiming that many of its arrangements with airports are loans, not leases. Distinguishing leases from loans is particularly challenging in the airports context because airports commonly combine elements of a lease and loan in a single agreement. The Court’s decision differed from two earlier Seventh Circuit lease-versus-loan cases arising from the United bankruptcy. In the two previous cases, involving San Francisco and Los Angeles Airports, the court agreed with United and found that the agreements were loans, not leases. The court noted the “critical distinction … is that the parties in the present case cemented their deal into one document.” “In the San Francisco and Los Angeles cases (in which we held two supposed lease arrangements to be secured loans), the underlying ground leases were addressed in separate documents.” This trilogy of United bankruptcy cases on leases provides critical guidance for airports seeking to understand the potential bankruptcy risks associated with different lease and finance arrangements. On July 17, 2006, the United States Environmental Protection Agency (“EPA”) issued a rule relevant to the hundreds of airports located in nonattainment areas for fine particulate matter (“PM2.5”). The agency issued a final rule providing “de minimis thresholds” for PM2.5 under the agency’s general conformity regulations. Under the EPA general conformity regulations, federal agencies such as the FAA must determine whether proposed federal actions (such as AIP funding or Airport Layout Plan approvals) “conform” to state or local air quality plans if the action will cause emissions to exceed specified de minimis thresholds. These conformity determinations can be critical and complex requirements for many airport development projects. The conformity regulations can, under some circumstances, require extensive mitigation, project changes or risk project delay. EPA designated scores of counties as being in nonattainment for PM2.5 in 2005, making the general conformity rules applicable to projects in these areas. However, until this new rule, EPA did not provide the de minimis thresholds applicable to PM2.5. Under the new rule, a federal action must cause an increase in emissions of PM2.5 or its precursors of at least 100 tons per year before triggering the requirement to conduct a full conformity determination. Note that EPA also intends to issue a different notice of proposed rulemaking regarding broader potential changes in the general conformity rules, but has not set a certain timeline for this proposed rule. This proposed rule could contain a number of provisions significant to airports. For background information on air quality rules as they apply to airports, Kaplan Kirsch & Rockwell published Introduction to Airport Air Quality Law. On July 20, 2006, the Transportation Security Administration announced the release of a new guidance document: Recommended Security Guidelines for Airport Planning, Design and Construction. This 333-page resource includes detailed information on incorporating security considerations into the planning and design for every part of an airport. In addition, the guidelines provide specific advice on assessing and overcoming vulnerabilities to security breaches of various kinds. Although federal law and TSA regulations impose only limited security requirements on airports, the guidelines will assist airports, particularly when undertaking new capital improvement projects, to ensure the highest possible level of safety and security. Kaplan Kirsch & Rockwell is once again organizing the annual AAAE Basics of Airport Law Workshop and Regulatory Update. The conference has been sponsored jointly by AAAE and International Municipal Lawyers Association. This year, the American Bar Association joins as a conference sponsor. It is the only national conference dedicated specifically to airport legal issues and is designed for both the seasoned airport lawyer and the government lawyer who is new to airport issues. The agenda includes a mix of basics on airport law and discussion of regulatory and legal developments. The conference this year will be held October 22-24 at the Downtown Doubletree Hotel in Memphis, Tennessee. Watch your e-mail for more information and registration information or contact Tom Zoeller at AAAE at tom.zoeller@airportnet.org to be added to the e-mail list for updates.